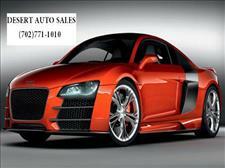 Welcome to Desert Auto Sales located at 4140 W Desert Inn Rd. in Las Vegas,NV. Please call us at 702-771-1010 to arrange a test drive or visit our website www.desertautosaleslv.com to view our complete inventory.